Kaanal is a public charitable trust founded by the noble hearts to create health awareness and improve medical facilities in and around Chettinad. The Trust is headed by Koviloor Aadhinam Sri la Sri Meyyappa Gnanadesika Swamigal as Ex-officio Chairman. Dr N. Krishnan, an eminent eye surgeon, Director – Kaanal's Koviloor Eye Hospital, Chennai is the Managing Trustee and Mr. K. Palaniappan, a renowned entrepreneur, Chairman - Rathna Group of Companies, Coimbatore is the Joint Managing Trustee. The Trust is ably supported by trustees and other representatives. Koviloor Eye Hospital (KEH) will focus on economically disadvantaged groups in rural areas by providing a comprehensive eye health facility in its main hospital located in Koviloor near Karaikudi, Sivagangai District. KEH is managed by KAANAL a not-for-profit trust. KEH will serve all patients, with more than half the number of patients receiving services free of cost, regardless of the service complexity. KEH is housed in a two storey hospital building on the main road leading to Koviloor Mutt. The land has been provided by the Koviloor Aadhinam. KEH’s hi-tech ophthalmic operation theatre is of International Standards with state of the art equipment. KEH will have in-house Ophthalmologists and visiting Super Specialty Ophthalmic Consultants. 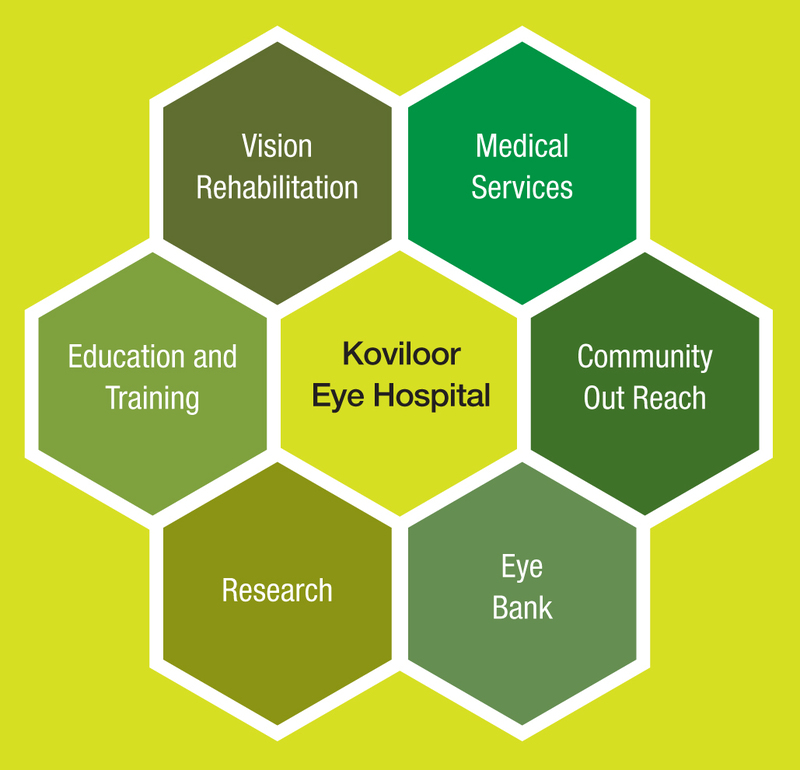 Koviloor Mutt has gifted two and a half acres of land to the KAANAL Trust for creating a charitable super specialty eye Hospital with Vision Rehabilitation and Enhancement facilities for blindness and low vision at Koviloor near Karaikudi. KAANAL’s vision is a super specialty eye care services research institute to be built in a phased manner at this site. KAANAL plans to achieve this vision with the help of like-minded philanthropists and Corporate Houses through their CSR. Apart from Eye Care Services, the hallmark of the project will be to identify the children born with blindness and rehabilitate them to have a better future. Financial contributions make it possible for us to set aside fifty percent of our services for those who cannot afford to pay. Your financial contribution towards KEH could be utilized in several ways: Eye care services for non-paying patients, training deserving eye care professionals, researching eye disease treatment strategies, or setting up new facilities. You can choose to make a one-time contribution or pledge longterm support for a range of eye care services. As a donor, you can also specify a person or organization in whose name you wish to sponsor the chosen services. We will be happy to acknowledge your support by naming the program or facility as per your request. Please contact us and we will help you make your contribution! All donations to the trust is exempted from Income Tax.